Developing brownfield sites can be a challenge; developing land which was formerly occupied by one of the oldest chemical works in the UK could be a monumental task. Halton Borough Council (BC) needed to remediate a site in Widnes on the northern banks of the River Mersey prior to construction of the Mersey Gateway Project, one of the top 100 infrastructure projects worldwide. The site will eventually lie below the northern embankment which will raise the road level up to the bridge span. The site was formerly occupied by one of the oldest chemical works in the UK, and had also been a chemical research facility during World War II. This long history, combined with the less rigorous environmental controls of the time, had left a legacy of high concentrations of complex chemicals impacting a sand layer at depths of up to 10m below the current surface. This provided a very challenging scenario that required a remediation contractor with significant experience in the remediation of chemical works and other industrial legacy sites. 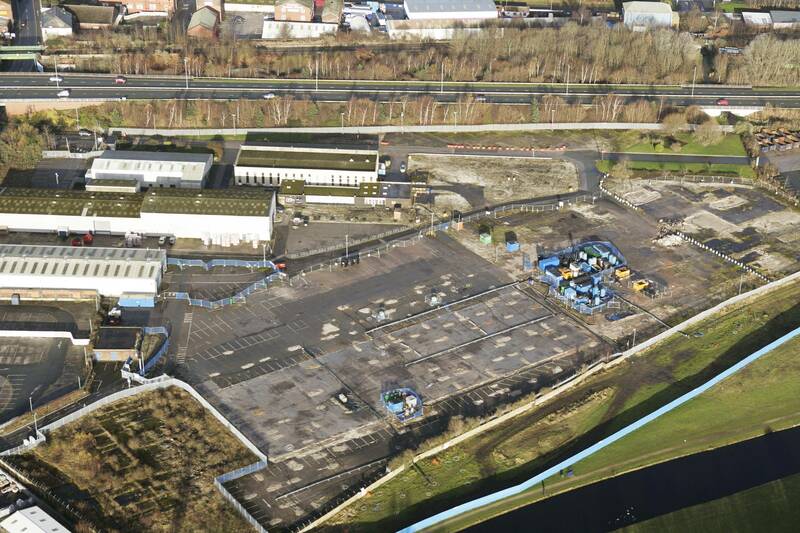 The remediation works were put out to competitive tender with Celtic Technologies Ltd, a specialist land remediation company, ultimately chosen to provide the Council with a solution that could deliver and integrate with the major bridge construction programme. Working closely with Halton BC and its –technical advisors Ramboll, Celtic had to satisfy the regulators that this legacy of groundwater contamination could be addressed. Celtic carried out a range of feasibility trials on the site in the summer of 2012. This assessed the effectiveness of a selected range of remediation technologies, with the results used to inform the design of the full scale remediation works. Celtic then designed a pragmatic remediation strategy which would minimise risk to the bridge construction programme. Calling on its class leading experience in the remediation of similar sites, Celtic’s approach was based on maximising the removal of contaminant mass from the sub-surface, integrating a range of Celtic’s proven remediation technologies. This included the extraction of liquid contaminants floating on the water surface through the deployment of high vacuum extraction plant; the use of specialist pumps to extract dense liquid contaminants which had sunk below the water table, and a final approach involving oxidising residual contaminants already dissolved in ground water. This design demonstrated the effectiveness and deliverability of the remediation scheme, giving all stakeholders in the project confidence that this complex remediation could be delivered and effectively integrated into the bridge construction programme. Celtic is already a framework contractor to the Environment Agency, and this comprehensive approach to site remediation was accepted by the Regulators. Full scale remediation works began in August 2012, with completion programmed for August 2013. The effectiveness of the approach has already been demonstrated with over 4,000 kg of contaminants removed within the first few weeks of remediation.